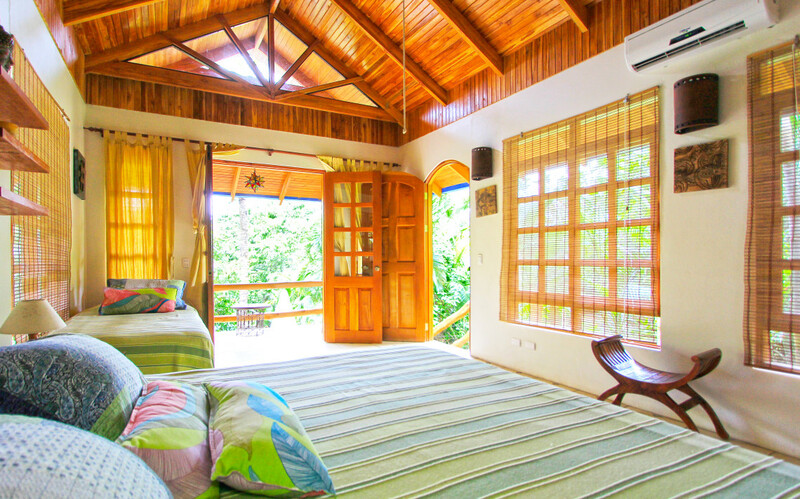 Armonia, best of the Costa Rica Honeymoon Bungalows. Bungalow Armonia’s decor provides a chic ethnic flair with an eclectic mix of hand carved Indonesian hand woods. This bungalow has all the wonderful amenities of all the other rooms and is stylish in sophisticated bohemian kind of way. A king size bed with pillow top mattress and a single bed provide ample sleeping arrangements. A/C, ceiling fan, room safe, over sized hot water shower with rain can shower head and cozy bedding complete this bungalow. Very stylish and comfortable chairs adorn the balcony that overlooks the lush gardens of Villas las Allemendras and the pool.